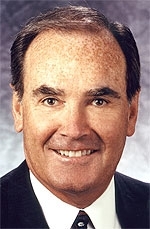 Russ Darrow is chairman of the American International Automobile Dealers Association and president of The Russ Darrow Group in Menomonee Falls, Wisc. In addition to NADA, the American International Automobile Dealers Association is lobbying against radical cuts in the retail network. Here, AIADA Chairman Russ Darrow says communities of all sizes across the country will suffer when dealerships close. As General Motors and Chrysler move forward with their respective restructuring plans, I have noticed a growing and unsettling wave of anti-dealer rhetoric in the news. If you believe what you read and hear, you might think dealers are the root of all the auto industry's problems. It's not unions, poor design, mismanagement, or inconsistent government regulation at fault. Oh, no. It is the dealers who have brought America's domestic auto industry to its knees. As you know, dealers are the retail customers of automakers. Aside from a small percentage of fleet sales, we are their only customers. Slashing the number of dealers doing business won't help sales. It will only shrink an automaker's pool of customers. I have a great deal of respect for the men and women overseeing the reorganization of our industry, but I wonder how much time any of them have spent in a dealership. I'm guessing very little, or they would know that the internet has already changed the face of this business. Fewer dealers won't mean those left can charge more per car. It only means consumers will have to travel many miles farther to get the vehicle they want and then to have it serviced. The Obama administration's auto task force and the executives of Chrysler and General Motors seem to think cutting their dealer bodies will solve all their problems. In truth, they are digging themselves deeper into a retail hole. I can't believe our government or anyone else thinks GM or Chrysler can make more money with 20-30 percent fewer retailed customers - their dealers. And it is not just automakers who will suffer when dealers close up shop. Communities of every size and in every region of this country rely on dealerships to act as a major employer and tax base, and to support local teams and charities. When dealerships go, they leave a vacuum that won't be filled in these difficult economic times. Take, for example, Tammy Darvish's Maryland-based dealership group Darcars. Her 26 dealerships employ 1,860 people. In 2008, total payroll was $88,632,224. Total federal income tax withheld: $20,917,205. Total state income tax withheld: $4,795,003. Employer payroll taxes: $6,381,520. Total paid to the 233 local vendors they do business with: $83,621,412. There is no replacing that kind of impact on a community, city, or state. This country doesn't need fewer dealerships. It needs more entrepreneurs like Tammy Darvish, who has built an empire while servicing her community. Dealers aren't the auto industry's Achilles' heel. We are its best hope for a recovery. AIADA is leading the charge to restore rationality to this very public debate. We are meeting with automakers, legislators, and task force members to remind them how valuable dealers are to this economy. Next week we will hold the 3rd Annual International Auto Summit in Washington - a very visible reminder of the strength of our membership. Do your part by registering today. Can't make it to Washington? Let us bring Washington to you. Click here to have AIADA arrange for your congressional representative to visit your dealership. Let them see firsthand what a dealer is worth.